It’s hard imagining Venezuelans rejecting Bolivarian governance under Chavez and now Maduro – responsible for vital social benefits most Americans can’t imagine, including free education to the highest levels and universal healthcare. Despite economic hard times because of destabilizing US policies and low oil prices, Venezuelans reject returning to the ugly pre-Chavez past. The support Maduro’s PSUV-led (United Socialist Party of Venezuela) 12-party GPP (Great Patriotic Pole) coalition first established by Chavez in 1998. Maduro said “(w)e have achieved a perfect and expanded alliance.” For the first time in Bolivarianism’s history, all coalition candidates are on the same electoral list. In June, Venezuela’s National Electoral Council (CNE) announced parliamentary elections will be held on December 6. Applications from 1,270 candidates were received to contest for 167 National Assembly seats – a unicameral legislature. Citizens are automatically enfranchised at birth. Everyone over age18 may vote by registering. CNE President Tibisay Lucena said over half a million new voters registered from February through late June – responding to a continuing grassroots drive to get all Venezuelans of voting age to participate in the electoral process Jimmy Carter calls the world’s best. In 11 of 12 elections held in the past 15 years, Bolivarianism triumphed. A December victory appears likely based on newly released Hinterlaces poll results. It showed two-thirds of Venezuelans intend voting in December – a large turnout for parliamentary elections. High participation favors the PSUV-led coalition. Only 4% indicated no plan to vote. Another 9% are undecided but lean toward participating. Over one-third favor the Great Patriotic Pole (GPP) PSUV-led coalition compared to 19% for the main opposition right-wing Roundtable of Democratic Unity (MUD) party. Expect the GPP to maintain its National Assembly majority – crucial to continue Bolivarian social justice popularly supported for good reason. It lifted millions of Venezuelans out of poverty, provides benefits never before offered, established model democracy, and constitutionally mandates equity and justice for all. 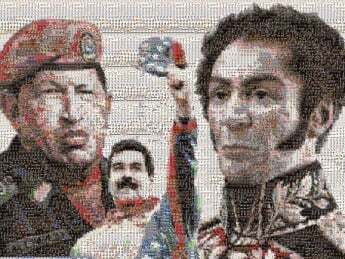 Chavismo lives. Bolivarianism is institutionalized. It’s vital to preserve. It’s polar opposite neoliberal harshness. America and Venezuela are constitutional world’s apart – freedom v. fascism, an easy choice to make.